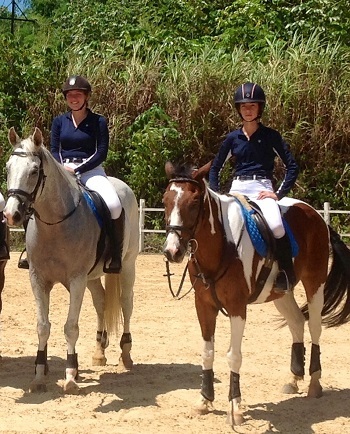 (CNS): Riders Isabelle Smith, in the Under 16 class, and CEA debutante, Chloe Fowler, in the Under 14 class represented Cayman at the third leg of the Caribbean Equestrian Association’s Junior Show Jumping Competition in Trinidad last month. In the individual competition, Smith placed 3rd in the Under 16s category, and Fowler placed second in the Under 14s category. After the team rounds, Trinidad were 1st with 10 faults, Jamaica 2nd on 26 faults with Cayman coming 3rd by a difference of just one fault with 27. This means that this year, the pack is extremely tight and it is still anyone’s game. Overall Cayman and Jamaica are in joint first place with 9 points, and Barbados and Trinidad in jt third on 7 points. The final leg of the competition is set for November. Each year, the four CEA countries, Cayman, Barbardos, Jamaica and Trinidad and Tobago, meet once in each country to compete over four show jumping courses. Each time, they compete on horses loaned by the country hosting the event. In September it was the turn of Trinidad to host the event. Barbados were unfortunately unable to attend the competition, which left Cayman, Jamaica and Trinidad fighting it out for points. During the team event in Trinidad both Smith and Fowler had tricky first rounds on challenging horses, picking up 6 and 9 faults respectively on the first day. After a course change for the next round, both riders returned to the arena and executed excellent clear rounds in round 2. The following day, Smith picked up 8 faults in the third round and Fowler picked up 4. As Barbados were unable to attend the competition, only three instead of the usual four round were required.